By 2043, this nation will experience a shift in its demographic makeup; the Census Bureau predicts that for the first time in U.S. history, non-whites will be in the majority. Many in the field of philanthropy are thinking about this pivotal moment for the country (just shy of 30 years away) and investing in strategies today to ensure that all people, regardless of their race and ethnicity, live to their fullest potential. As we see it, the well-being of America is at the heart of work on racial equity and justice. While many can agree that all people should have the opportunity to live, work and contribute their assets to the greater good, there are divergent ideas about the barriers facing communities of color in reaching this aspiration as well as strategies to overcome them. 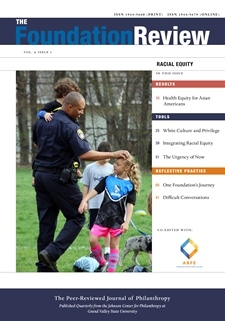 For over 40 years, ABFE (and its members) has been a thought leader and advocate in the field of philanthropy to achieve racial equity for Black communities. At ABFE, we see racial equity as a desired outcome or state: when you cannot predict advantage or disadvantage based on race. Pursuing equity for our communities is necessary and important work, requires a specific set of competencies and skills and must be addressed over time. Bezahler’s article describes the Edward W. Hazen Foundation’s “slow and patient work” to support youth in their efforts to address harsh, inequitable school discipline policies in NY and the thoughtful engagement of their grantees in the strategic direction of its grantmaking. Gulati-Partee and Potapchuk’s important work focuses on addressing white privilege in racial equity grantmaking – critical work often left off the table — and a preview of some of their tools to address it. Cunningham, Avner, and Justilien review of the role of philanthropy in addressing racial justice and poverty in the U.S and the current work of the Northwest Area Foundation to improve outcomes for Black people as well as other people of color. Pickett-Erway, Springgate, Stotz-Ghosh, and Vance provide a candid summary of the experiences of the Kalamazoo Community Foundation’s journey in becoming an “anti-racist organization”; the importance of self-awareness of foundation staff and several unintended consequences that translated into powerful lessons-learned for the organization. Endo Inouye and Estrella’s contribution describes the use of the W.K. Kellogg Foundation funds to improve health outcomes for Asian American, Native Hawaiian and Pacific Islander populations. Redwood and King summarize the Consumer Health Foundation’s own journey in embedding racial equity in all aspects of their work. Each of these articles demonstrates the importance of leadership and long-term commitment to transform philanthropy and communities for the betterment of all people. We thank the authors for their current and ongoing struggles to advance the field of racial equity grantmaking and anticipate continued learnings from their experiences.